Mathematics has always been a subject infamous for being difficult and with less than zero applications to life. That’s why I decided to build with IES Navarro Villoslada’s 3ºESO Bilingual Programme students a figure which would help us to understand one of this year’s most difficult units: progressions. 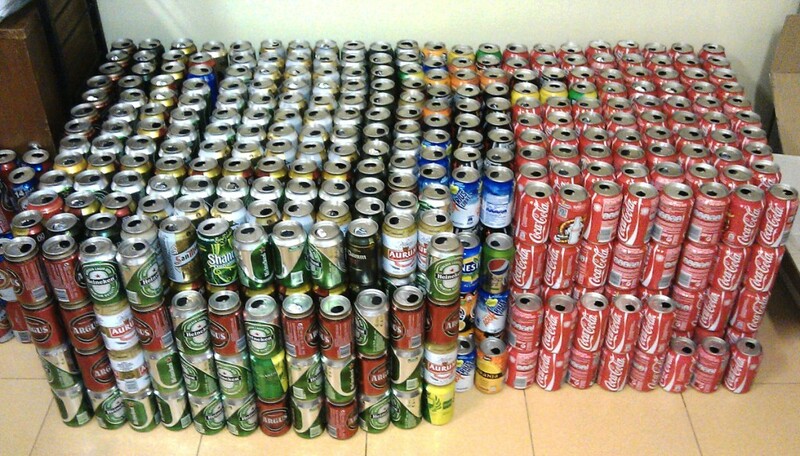 The challenge was simple: we needed to gather more thatn 1000 soda or beer cans to build the famous Sierpinski’s Triangle and try to relate it with 3º ESO’s mathematical content. 3) Repeat this process once again with the three triangles obtained before. Don't forget to remove the central triangles. This mathematical object has two amazing properties: it repast itself no matter the scale used and the infinite iteration of the process described above leads to a figure whose surface is zero and whose perimeter is infinite. The necessity of using a whole classroom for working and gluing brought about the fact that this project had to be done in the afternoons. More than 1300 cans were collected. And we started gluing cans. Our first goal (and the toughest one) was to glue 121 9-can triangles. For this task, we used 9 tubes of glue, 2 wooden moulds and 2 glue-pistols. Each one of these triangles was built joining 3 blocs of 3 cans each. To both visualize and enhance the concept of fractal in our Sierpinski’s Triangle, we used 6 different colours to paint the bottoms of the cans. This way, it is not difficult to notice that any triangle includes those of the previous levels. · One tin of pre-paint. · Five tins of paint: purple, luminescent blue, real yellow, china red and TK-314 green. · One spray of fluorescent red. It took us two days and a couple of ladders and one scaffolding, but after those long 4 months our project was finally placed where it belonged. where d = 66mm is the diameter of one can. Furthermore, to get these expressions we had to deal with radicals¸ Pythagoras Theorem and the expression to get the height of one triangle in function of its side. Therefore, we knew beforehand the dimensions of the wall needed to place our Sequence of Sierpinski Triangles!